A perfect butter is supposed to know everything. James was a perfect butler. But he knew too much. 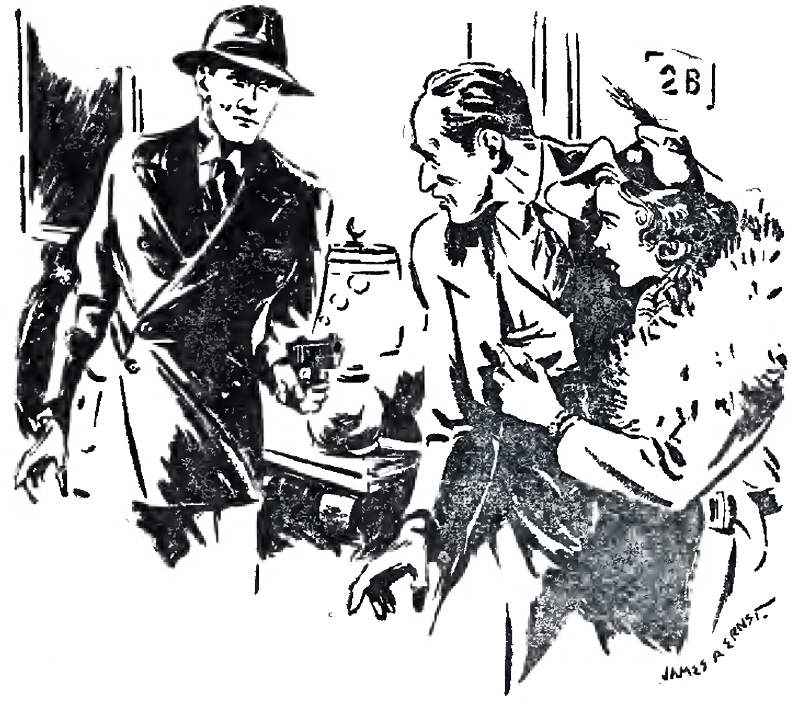 As he approached the bedroom of Mrs. Norwood Fairbanks, James, her newly-hired butler, halted suddenly. Through the closed door he could hear his mistress talking on the telephone. He listened carefully. He heard her say: "Yes, dear, the new butler seems to be perfect. I'm very glad I engaged him." James allowed a smile to flit across his expansive, but normally impassive face. So Mrs. Fairbanks thought he was a perfect butler, did she? Not surprising. All his list of clients had thought the same when he was in their employ. Each had later given him a glowing reference. Not one had dared do otherwise … . So she called the person she was speaking to "Dear." That merited attention. Mrs. Fairbanks was saying: "I miss you so much, Norwood." Merely a phone call to her husband, out West on a business trip. Not worth while listening to such a conversation. He knocked on the door, a gentle knock considering his bulk. James heard a few more words, followed by good-byes, and knocked again. He entered the superbly furnished room and bowed to the still beautiful woman of forty who occupied it. "Your orders for the evening, madam." She turned her dark eyes on him. "I'm dining out and going to a concert afterwards. I'll not return till late." Half an hour after Mrs. Fairbanks left the house, James re-entered her bedroom and approached her ornate Italian writing desk. Carefully he examined its intricate carvings. His eyes gleamed as he located a secret drawer. From his pocket he drew a set of thin skeleton keys. The drawer was quickly opened. Only one thing lay in it — a packet of a dozen letters, tied with baby-blue ribbon. He picked up the packet and thumbed it hurriedly. All in the same handwriting. He glanced at one, addressed to "Leona darling." The first name of Mrs. Fairbanks. Good, so far. Hastily he scanned ardent passages till he came to the signature "Angelo." Wonderful! That bore out what he understood before applying for the position. He had heard that Mrs. Fairbanks had not always been discreet. James stuffed the letters into a capacious back pocket. Before leaving the room, he glanced over his mistress' check book and made a mental note of the monthly allowance she received from her husband. Early the next morning he waited upon Mrs. Fairbanks. With a woebegone expression on his face, he let her glimpse a telegram which he partially drew from his pocket. "To my regret, madam, I have just received word that my mother is very ill. So ill that I must leave for her bedside at once. May I, therefore, tender my resignation?" "Your resig — Why, I'm so sorry. I was quite well pleased with the way you were handling your work, James. Of course you may visit your mother. If you will be gone for a few days only, I'll keep the position open till you can return and resume your duties." "There is no telling, madam, how long I must be away. I wouldn't want to inconvenience you for an indefinite period. However, I will promise to get in touch with you as soon as I do return." On the following day, Mrs. Fairbanks received a phone call. "James Frye speaking, madam." "I'm so glad to hear your voice. How is your mother? I hope she is well enough so you can come back now. As yet, I've engaged no one to take your place." "Alas, madam, I fear I will never reenter your employ. However, I hope this conversation means the beginning of cordial relations between us." "Why, yes, madam. Do you recall certain letters which you were so careless as to leave in your writing desk? If you will examine that desk, you will see that they have been removed for safe-keeping." He heard her gasp of dismay followed by "What!" 'Yes, Mrs. Fairbanks, I have placed them where they will be safe from your husband's eyes — under certain conditions." "Simple ones. I will merely charge you a nominal fee for safe-keeping. It would give me great pleasure to add your name to others for whom I am keeping valuable documents — in your case for a hundred dollars a week." "A hun — Why, that's outrageous! I couldn't possibly pay that!" "I beg your pardon, madam, but I took the precaution of glancing through your check book. If you would cut down on your wardrobe — "
"I doubt it, madam. I feel certain that your husband would pay — "
"No, no. Don't speak to him about those letters. I — I'll try to raise the money somehow. I just don't know how, though." "There are many ways, Mrs. Fairbanks. When I see you tomorrow, I will suggest some." "You — you — "
"Don't say it, madam, or I will be tempted to increase my modest demands. Now as to the first payment — could you bring it to my apartment tomorrow morning? Say at eleven? At that time you will run no risk of meeting others of my regular clients." "I — I guess I must. Where do you live?" "At the Woodbine Apartments on Fiftieth Avenue. Seventh floor." After he hung up the phone, James rubbed his hands together. She would (make an excellent addition to his list I of clients. From now on he need never play the part of a butler again. His income would enable him to retire and live the life of a gentleman. Promptly at eleven the next morning, he heard a ring at the door of his apartment. He opened it and bowed. "Delighted to see you, Mrs. Fairbanks. Won't you come in?" "For — for a moment." She seemed palpably nervous as she entered his living room. "I — I would like to speak to you about — about buying back those letters." "I regret, madam, that those letters are not for sale." "Not for sale? But please, James, those letters are so precious to me." He permitted himself to smile. "And even more precious to me. Let us understand each other once and for all. I will not sell you those letters. I will merely act as their guardian for the small sum of one hundred dollars a week." It looked as if tears were about to flow. Brusqueness might stop them. "Have you brought the first payment?" She bit her lips. Opening her purse, she drew out five twenty-dollar bills, and extended them towards James. "Here is your blood money." He raised one hand. "Please, madam, don't consider this payment in that light. Please think of it as a mere gift of expiation." A dangerous light flashed momentarily in her eyes. She opened her mouth, only to snap it closed. After a brief pause, she asked in a strained voice: "May I leave now?" "Certainly, madam." He stepped towards the door. "Remember to return at the same hour next week." "Not necessarily money." He was bowing her out into the hall. "For example, I recall you have a lovely Dresden china lamp in your living room. You could tell your husband that some careless parlor maid knocked it over and broke it into a hundred pieces. That lamp should add greatly to the appearance of my own living room. I would allow you — let me see — say, three weeks' payments in return for it." She was in the hall now. "You — you — " With a great effort she seemed able to control herself enough to beg again: "Won't you please sell me those letters?" "No, I will not sell them. That is definite. I will merely act as their guardian for the small weekly fee I mentioned." She shook her head. "You have no heart." He smiled again. "That is why I am a success in my profession." Her eyes flashed fire, but she said nothing. With a shrug of her shoulders she turned to leave. At that moment a man carrying a small suitcase approached from the direction of the elevator. Suddenly he dropped his suitcase and thrust a gun into James' stomach. "Up with your hands!" James raised his arms at once. The newcomer half turned to Mrs. Fairbanks. "Okay, lady?" The man snapped at James: "Where's them letters?" James grinned. A big bluff on Mrs. Fairbanks' part of course. She couldn't stand the notoriety of a shooting or a slugging. "What fools you both are! To think I would be careless enough to let precious documents remain where they might be stolen. The letters to which you refer are perfectly safe in my box at the bank." "Thanks for tippin' me off where they was at, you rat. Now come along with me and get 'em." James was laughing by now. "Enough of this bluffing, my friends. Mrs. Fairbanks, this crude attempt to force me to deliver you the letters makes me insist on your bringing me two hundred dollars next week. Let this be a lesson to you. You might as well admit defeat and tell your boy friend to put away his revolver and leave. If he doesn't, I shall be forced to complain to the police." "You're talkin' to one of 'em now, wise guy." The man's free hand pulled back his coat. "Detective Hayes from headquarters." "Sure." The detective slipped a pair of handcuffs over James' wrists. He turned to Mrs. Fairbanks. "Mighty brave of you, lady, to show up this here rat. Mighty few folks would've had the guts to do it. The department sure thanks you." James sneered, "I'll be sorry for you, madam, when those letters are published in the newspapers. I certainly would like to hear what your husband will say when he sees them." That evening Mrs. Fairbanks was again telephoning her husband. "Who would have taken James for a crook? He was so efficient and so gentlemanly. Such excellent references, too. I'm beginning to wonder about the people who wrote them … I'm awfully sorry about the letters. I'm afraid people will be greatly amused when they read the ardent passages you wrote me when we were first married. Remember how you signed them 'Angelo' because it was the silly pet name I gave you on our Italian honeymoon? Now you'll have to write me some nice new letters to keep in my secret drawer till the police give me my others back." After saying good-bye and hanging up, Mrs. Fairbanks locked the door leading to her bedroom. She pulled out the secret drawer of her writing desk. Her hand groped about in the cavity behind it. From there she drew a packet of letters tied with pink ribbon. Sighing, she kissed each letter, then consigned them to the flames in her fireplace for safekeeping.